This striking side tables combination of crisp, geometric lines, sparkling smoked glass and luxurious gold finish recalls the glamour of the 1920s. Despite its ethereal appearance this piece is built to last - constructed of sturdy steel and tempered glass, and offering two tiers for added style and convenience. Bring a touch of Gatsby-esque flair to a range of settings this would make a devastatingly chic nightstand in the bedroom, a support for a favourite plant in the hallway or a tasteful resting place for an evening highball in the living room. Built out of a sturdy steel and layered in a rick black nickel finish, this accent tables pedestal-like construction is ready to display your finest home ornamentation. The creatively overlapping elliptical base of this piece creates visual depth and interest that add an extra dimension of contemporary style. A wonderful place to display a lamp or vase, or to park your drink for the evening, it exudes a glitz and glamour that allows it to stand on its own whether being used for functionality or to accentuate its surroundings. Be adventurous and add this mirrored accent table into to your living space. Its circular form, outlined with rectangular shaped mirror details are sure to catch anyone's eye. Its sturdy three legged, triangular shaped base provides full support, allowing you to place picture frames, vases and decorative pieces on its smooth mirrored surface. Don't wait to add this must-have table to your home! Designed with stylish simplicity, this traditional console table will be an effortless addition to your home decor._x000D_ An antique white finish paired with gently flared legs and scalloped apron gives this classic Demilune shape a fresh update. Place a decorative lamp, picture frame or accent display piece to add warmth to your decor. Quality built with timeless appeal make this piece the perfect addition to any entry way, living room or bedroom. 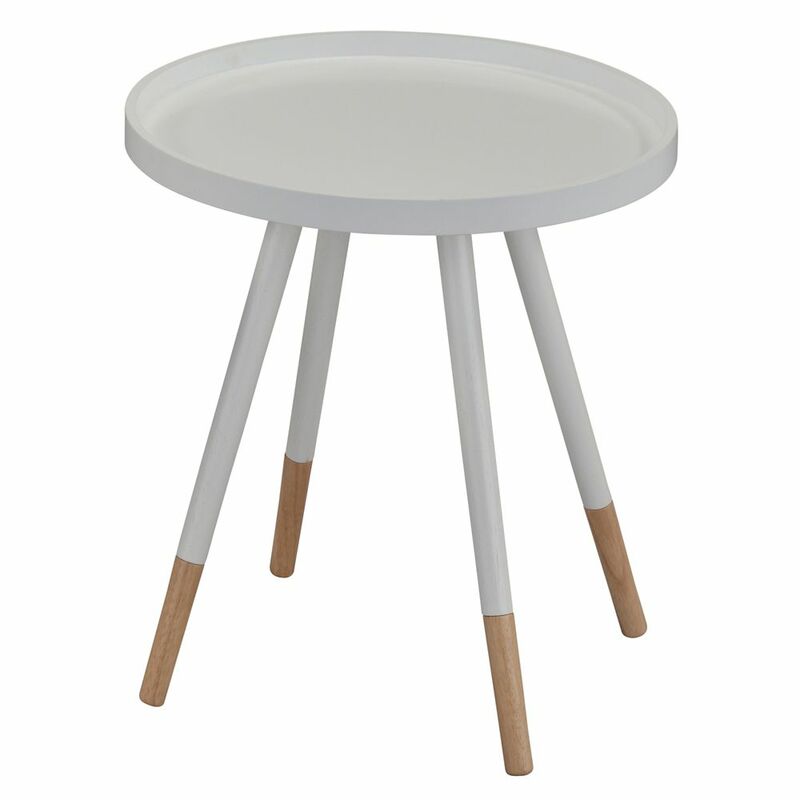 Hue-Accent Table-White This fun little accent table will spruce up your dicor and add functionality at the same time. Great for pulling up to the couch at dinner time when you don't want to pause your binge-watching of Mad Men, or for holding cocktails when entertaining. Think outside the box and place this table in the corner of a powder room, or in a hallway with a pretty vase perched on top. The flared leg design has a retro feel, while the natural accent on the legs adds a feminine touch. This solid wood table is sure to become one of your favourites pieces.